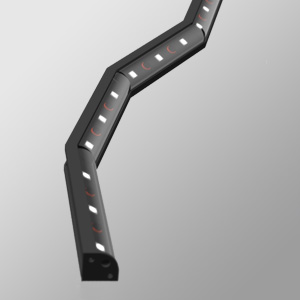 The FLOW FLEX is a concealable field curvable LED lighting system made from a higher thermal conductive grade of aluminum. Its versatile design allows you to choose from a 30° or 60° projected light angle. These two factory-configured options allow for an excellent light distribution in vitrines, shelves or various cove lighting applications. The increments allow you to curve the FLOW FLEX without any visible light interruption. Furthermore, the fixed light angle assures a reliable optimal positioning of the light beam once installed on the field. Available in 3W/ft, 4W/ft, 5W/ft, 6W/ft, 7W/ft and 7.5W/ft. Increments are ready to be curved on-site. Light engine comes with a tilt angle of 30° or 60° depending on the installation position. X= 2”, 4” or 8” (50, 101 or 203 mm).